Exciting, unexpected, realistic, impressionistic, abstract--the bunny paintings of celebrated artist Hunt Slonem have something for everyone. A treasury of enchanting paintings that are at once pop culture and fine art, Slonem's bestselling collection appears here in a brand-new edition. In Bitty Bunnies, Slonem's world-renown paintings have been transformed into a smaller, more compact version, easy to take with you on the go! As Bruce Helander writes in the introduction to the book, "The use of a bunny as a subject has a distinct and delightful charm of its own. Slonem takes a cue from a bunny's soft and independent character, usually one at a time in a portrait that convincingly accommodates tall, unruly ears and some long whiskers to boot. His are a line-up of fuzzy likenesses that are created quickly and forcefully with a clear sense of compassion and precision even though they are purposely abstract." 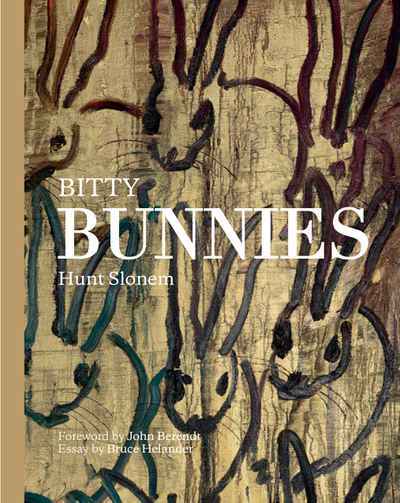 Bitty Bunnies is a unique compendium of paintings by a fine artist with a worldwide reputation that provides a remarkable ode to one of nature's most beloved and symbolically rich creatures, ready to bring good fortune to every lucky viewer, now in a size that is as cute as the art itself. The collection here is whimsical, gorgeous, lively--every shape and form of bunny as a single subject and en masse is presented by an artist whose design sense is as acute as his artistry as painter. This is a collection destined to appeal to art- and nature-lovers alike; a body of work as inimitable as it is recognizable and sure to appeal to anyone who encounters it--as is the artist himself.